3) He must have showered at least sometime in the last 24 hour period. There are NO exceptions to this. 4) He will either be able to spell or know how to use spell check. There is NO Google translation for IDIOT to ENGLISH and I am not going to waste any more time deciphering incoherent text messages, emails, etc....I get enough of those from my users. 5) He will under NO circumstances think that wearing a leather jacket with Disney's Enchanted Castle patches emblazoned upon the arms is a good thing (this rule was developed on the Metra today - three guesses why). I don't care why you have the jacket. It is NOT cool. It is NOT ok.
Well, that's it for now. I'm tired. I had my admissions interview this evening and a loooong conversation with my academic adviser. I am wiped out! Night! Well, I believe that while I have not made the most out of every second since my last post, I've done pretty well. I've decided to go for my Masters in Business Administration - so I graduate on August 24th and I begin grad school on August 25th. Isn't it wonderful that I get such a generous break? Anyway, while I'm doing the grad school thing, I'm going to be working on my application to Kent law school. YAY! Hopefully, they'll want me...Its the only law school I'm really interested in attending...My plan is to graduate from the masters program and then get about 3 months off before starting the law program. I'm particularly interested in their intellectual property law area of concentration. I wish I had figured all of this out years ago! Oh well! Have you for your message. Since I currently am not published, the incoming mails to my secretary. You can reach my Secretariat under. 16 years later and they can still rock - and apparently so can I. LOL...Last Saturday Lo and I ventured down to The Vic to catch Crowded House in concert. I hadn't been to a concert since I saw...wow...Um...Shania Twain at the United Center (what an horrid venue). Anyway, the concert was fantastic though this time, rather than be down in the thick of things, we seated ourselves in the balcony...I remember the first time we saw them - we danced and sang all night long and then drifted over to Muskies and shared fries with the opening band, School of Fish. That night was amazing. And, actually, so was this past evening but for very different reasons - though, maybe not really. Lo was happy for the first time in a long time...I won't say she was happy for the first time since our first CH concert but its been a long time...Between her divorce and health issues she's really had a rough time of it and I'm so happy for her. She leaves for Austin in a couple of months but I've already decided to go down for our "anniversary" in November. She and I met when we were 15. We sat near one another in a couple of classes and when I found out that her family wasn't doing anything for Thanksgiving (this disturbed me greatly) I invited her to our family gathering. After we both fed my grandmother's disgusting gelatinous pink coleslaw creation to the family dog, I knew I'd found a friend for life! And while we sometimes manage to go months with nary an email, we're always there for each other and we know it. She's lived in Arizona, traveled abroad and set up house on the south side of Chicago but no matter where she is, I know I can count on her. And the same holds true for her....So cheers, Lo! I love you and I am glad that happiness has found you - even though it was a long time getting there. 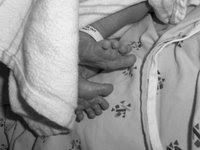 BTW - the pic is actually one I took of Milo, T's baby, shortly after his birth TWO years ago...my, my..where does the time go? Ok. So I'm not big into sweets but every so often I get a hankering for candy. I prefer tart candy - SweetTarts, sour gummi worms, etc. So the other day I was having a craving and I purchased a box of Runts. My favorite are the pink. I don't know what flavor they are trying to be but I love them. I would buy them by the pound if I could. Happily, I head home with my box of treats. 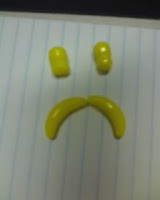 Now, there is a downside to Runts, namely Yellow...Yellow is a BAD flavor in many cases (with the exception of lemon). And Runts proves this to be true. The yellow Runts are not lemon. I believe they are attempting to flavor them as banana. It fails. Miserably. Resulting in a disgusting, semi-phallic shaped candy that must be removed immediately from the mix lest it contaminate the other pieces further. I dump the contents of the box onto a paper towel and there they are, the old reassuring ones, mixed with the Hater Banana ones and then the new flavors - some odd, round, reddish ones and then deformed pear shaped and YELLOW...UGH...but I have to try them - just in case they're lemon and delicious....I have hopes!